Coral reefs in protected areas that regulate fishing and pollution have declined to the same extent as reef systems in unprotected areas, according to recent research. The study, published in the Annual Review of Marine Science in January, determined that ocean warming is the primary cause of the global decline of reef-building corals. The researchers behind the study say their findings are consistent with a growing body of evidence that shows so-called “managed resilience” efforts, such as controls on fishing and pollution, don’t help coral reefs cope with the impacts of climate change. Coral reefs in protected areas that regulate fishing and pollution have declined to the same extent as reef systems in unprotected areas, according to recent research. The study, published in the Annual Review of Marine Science in January, determined that ocean warming is the primary cause of the global decline of reef-building corals. Managed resilience is essentially a conservation strategy, advocated by many reef scientists and adopted by many policy makers and reef managers, based on the assumption that threats to species and ecosystems are cumulative in their impact, and that by mitigating as many of these stressors as possible, reef systems will be better able to withstand the impacts of global climate change, coral bleaching, disease outbreaks, and other threats that cannot necessarily be managed locally. In other words, there was no evidence that establishing marine protected areas (MPAs) in an attempt to shield reef systems from the impacts of fishing and pollution reduced the amount of coral killed off by extreme temperatures or helped corals recover more quickly from major disturbances like disease, bleaching, and large, destructive storms. The average amount of living coral cover on tropical reefs has declined by 50 to 75 percent in nearly all regions of the world over the past few decades, the authors note. 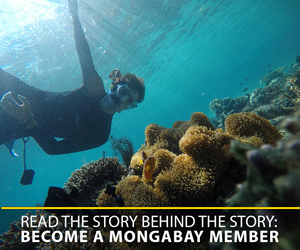 The 18 case studies Bruno and team analyzed included data from a total of 66 protected reefs and 89 unprotected reefs around the world, from the Caribbean to the Indian Ocean. Those studies compared the effects of mass bleaching events, major storms, disease outbreaks, periods of acute ocean warming, and other large-scale disturbances on coral cover both inside and outside of MPAs. 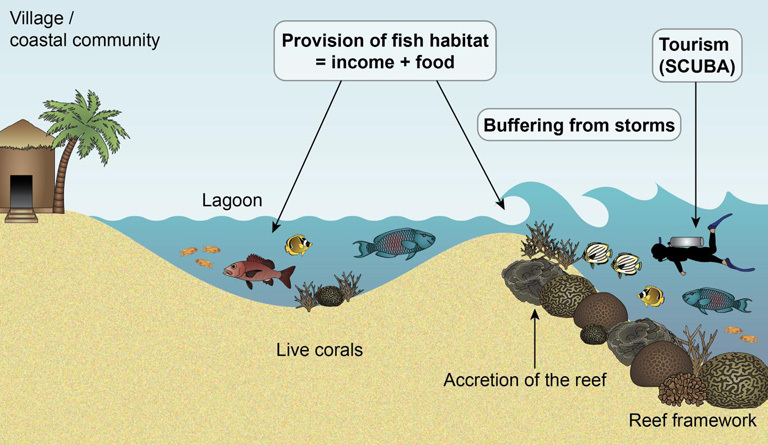 One of the most common policy responses to declining coral cover is to ban fishing, since destructive fishing practices can cause coral mortality directly, while reduced populations of herbivorous fish like parrotfish can lead to seaweed and algae flourishing and crowding out coral. But Bruno and team found that protecting herbivorous fish can actually be detrimental to healthy coral, because many parrotfish species are also corallivores who feed on some of the most important reef-building corals. 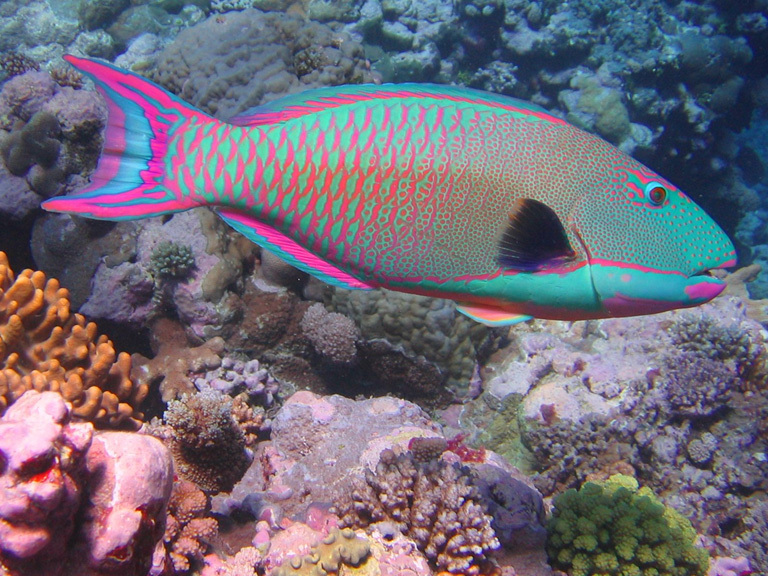 A male bicolor parrotfish at home on an Indo-Pacific coral reef. Photo via Wikimedia Commons, licensed under CC BY-SA 3.0.